What do you get when you lock a pair of huaraches and a pair of Chacos in a honeymoon suite? 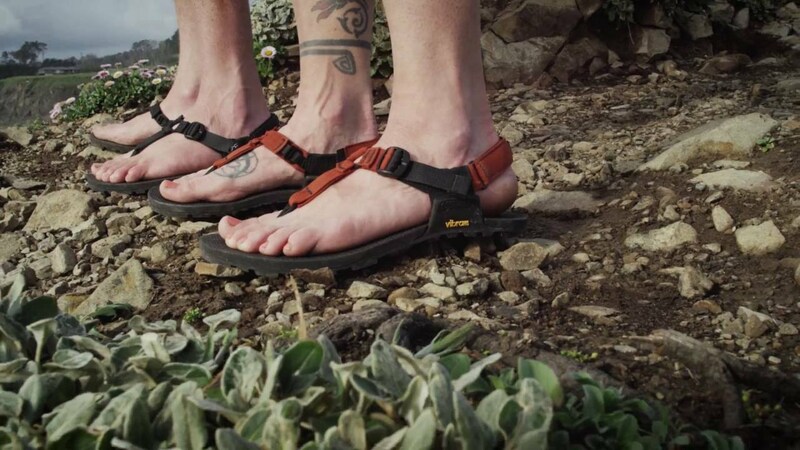 I’ll tell you; it’s a pair of Bedrock Cairn and Cairn 3D Sandals. If you’re not familiar with huaraches, they’re a sandal made from rubber, leather, or whatever trash can be found by the Tarahumara tribe of Mexico—made popular by the 2009 best-selling book Born to Run by Christopher McDougal. They’re thin, strong, and basically the closest thing to being barefoot. In short, they’re amazing. Chacos are a bomb-proof, Vibram-rubber-soled sandal that are up for any challenge. Together, these Bedrock Sandals—both the Cairn and the Cairn 3D—are a unique combination of ruggedness and minimalism. And that is lovely. They’re not as bulky as most sandals, yet they fit tightly (in a nice way) around the forefoot. The tightening strap plus the velcro heal support are a strong combination. In addition to that, there’s a hook for varied sizing based on foot-volume size regardless of someone’s individual foot physiology. That makes three areas that can be resized, great for people of almost any foot size. The soles of the Cairn are thoroughly constructed, but at 14 mm are thin enough to have some flex, to give your foot feel while they’re gripping the ground. (There’s also a zero-drop, i.e. the same thickness from toe and heal.) The construction is strong enough that I feel like you could do basically anything you wanted in these—hike, run, wear casually, enjoy in the water, etc. etc. This is aided by aggressive lugs that increase stability, while shedding mud and debris—as well as sand, if you're like me and you enjoy making the jaunt from Orlando to one of the nearby beaches to play. The sandals are constructed with cord in between the toes. And while that may be seen like it would grate on the space in between the toes, it’s actually quite comfortable. I didn’t have any irritation whatsoever. They’re also extremely packable, which is always nice on a trip. For those production-conscious, the Bedrock sandals are assembled in the US with domestic- and foreign-made parts. Because of this, they are resoulable. There are a few things that make the Cairn 3D different. First, there’s a little ledge that sits beneath the joints in the toe that gives the toes a little extra leverage. This is helpful if you’re running, walking, or hiking in rain, giving extra traction. Second, they have more grip on the top so it’s more difficult for your foot to slide around. This, however, has the added by-product, along with some additional thickness in the sole of making them have less flexibility. The soul is also just a wee bit thicker at 16mm, with much of that being an advanced anatomically-molded footbed that adds arch support. For the people who like extra support, this will likely be a welcome amendment. For me, I hate that, as I don’t like extra distance between them and the ground.